Internal customers are organizational or contracted employees to whom you provide information, products and services. These people typically use what you offer to deliver service to their customers. Unfortunately, many employees fail to realize the importance of developing powerful strategies for building and maintaining strong internal customer relationships. That is too bad because internal customers are just as important as those outside the organization. Still, some employees fail to realize that everyone in the organization is a customer service provider, even if they work behind the scenes in a support function. This is why you should never forget that you are an important part of the customer service chain no matter what your job title. 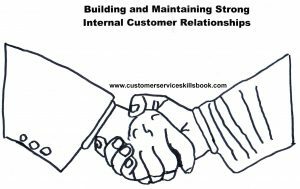 The following are powerful strategies for building and maintaining strong internal customer relationships. Develop positive relationships. Make an effort to greet others pleasantly each day and display common courtesies such as saying “please” and “thank you.” Do not forget the power of such simple acts. The impact your success and that of your internal customers depends on the strength of your internal relationships. Listen objectively. When another employee has an idea, take the time to listen and discuss it. This is especially true when it affects external customers. Keep and open mind and consider the merits of what is offered before responding or making a decision on any action needed. Take time to get to know more about your internal customers. Possibly takes breaks with your internal customers. Go to lunch or talk before or after work in order to get to know them as a person and not just as another employee. People are more likely to provide better internal customer service when they like the person they are serving. Learn about customers on a personal level and about the job that they do. This can lead to a better understanding about what they might have to offer and how you might be able to assist them. The result might be that your job and service to your customers might become easier. Taking these simple steps can also give you a better understanding of organizational structure and departmental functions. Show appreciation for help provided by others. If someone goes out of his or her way to assist you, take the time to acknowledge it. This could be a text or email message, or more powerfully, a hand-written note. Depending on the effort of the person, perhaps give a small reward. For example, give a hand-baked jumbo cookie along with a personalized thank-you note for any extra effort they provide to help you. Acknowledge the contributions of others. Most people like to be appreciated. An important thing to remember is that you should always give credit for work done by others and never claim it as your own. The latter can lead to resentment and actually get you fired. Avoid office politics and gossip. One of the quickest ways to get a bad workplace reputation is to become the person who acts like a pollinating bee. Do not move from one person to another sharing stories that you have collected about things that are going on in the office or with another employee. That type of behavior can quickly tarnish your reputation. Such actions cause loss of productivity time that you can use to better serve your customers. They can also, gain you a reputation as someone who is not trustworthy or is unprofessional. Respect diversity. Today’s customer base is diverse including people all shapes, sizes, abilities, and backgrounds. Employees must learn about and appreciate people and groups who may look different in order to appreciate varying views, values, and beliefs. This pertains to both external and internal customers. Since we spend the major part of our life interacting with others in workplace and job situations, everyone benefits from better understanding people. Just because someone might look or act differently, have an accent, or not have the same knowledge or abilities as you does not mean there is something wrong with him or her. Embrace and respect diversity for the benefit of all internal and external customers. Help others. Even if it means you have to put out extra effort, take the time to assist your internal customers. If you cannot do so immediately, negotiate a time when you can help. People will likely remember your generosity and willingness to assist them when a time comes where you need help. Be reliable. Whenever you commit to something, you should follow through by delivering as promised. This includes meeting deadlines for information needed by others in your organization. In many cases, someone might request materials or products needed to serve their external customer(s). If the need is not addressed in a timely manner, external customers may become dissatisfied and the trust with your internal customer can be lessened. Another potential effect is that those internal customers may be penalized for poor performance. Ultimately, your failure to meet deadlines can also cause the organization to lose business revenue and suffer ill effects from negative publicity. Likely, this chain of events will have negative consequences for you. The powerful strategies for building and maintaining strong internal customer relationships in this article are important to your success. While they can help improve relationships, continue to search for additional ideas. That can improve your ability to deliver stellar service to all customers. The books Customer Service Skills for Success, Please Every Customer: Delivering Stellar Customer Service Across Cultures and How to Be a Great Call Center Representative provide additional powerful strategies for building and maintaining strong internal customer relationships and for delivering stellar service to internal and external customers. Bob Lucas has been a trainer, presenter and adult educator for over four decades. He who has written hundreds of articles on training, writing, self-publishing and workplace learning skills and issues. He is also an award-winning author who has written thirty-three books on topics such as, customer service, brain based learning and creative training strategies, interpersonal communication, diversity, and supervisory skills. Additionally, he has contributed articles, chapters and activities to eighteen compilation books. Bob retired from the U.S. Marine Corps in 1991 after twenty-two years of active and reserve service. This entry was posted in customer relationship management, customer retention, customer satisfaction, Customer Service, internal customer service and tagged building customer relationships, internal customer service, serving internal customers. Bookmark the permalink.